If [my son] Reese could grow up to be the person Jimmie Reese was, that’d be quite a thing. If you didn’t like Jimmie Reese, there was something wrong with you. 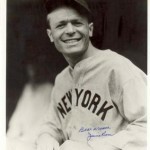 Jimmie Reese was best known for two things – neither being his .278 batting average in three seasons playing infield for the New York Yankees and the St. Louis Cardinals. And late in life, after decades of managing in the minor leagues and scouting (here is the link to his JBM page), Reese crafted a second baseball career – a long career. That came as a coach with the California Angels. There, he specialized in the art of fungoes: self-hitting baseballs to players on his team prior to games. It is a drill for players to practice catching fly balls and fielding grounders. Reese’s infectious personality made him a beloved figure with the Angels. 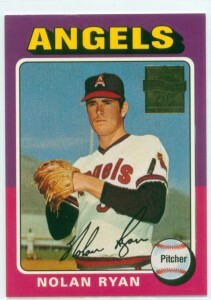 So much so that Nolan Ryan named his son for him. 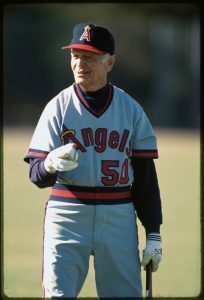 Reese was listed as an Angels coach until his death in 1994 at the age of 92. In 1995, in a statement signifying what he meant to the franchise, the team retired his No. 50. 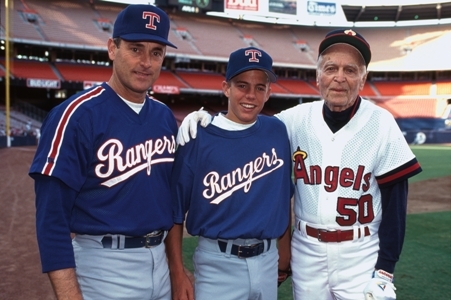 In a special Q/A, Nolan Ryan, who pitched for eight seasons with the Angels, and Norm Sherry, who worked as a coach with the Angels, share their reflections on Reese. Jimmie Reese had such a long, long career very late into his life. He pretty much lived his whole life in baseball. Nolan Ryan: You can pretty much sum that up like that. 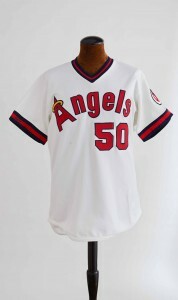 He started out as a batboy for the Los Angeles Angels in the old Pacific Coast League. From there, he became a player. The majority of his career was in the PCL. The PCL was kind of the big leagues of the western part of the United States. … I remember him talking about when he was a batboy and growing up in L.A. He just had a passion for the players and the relationships he had with some of the great players in the PCL, and then playing [there] and finally getting sold to the Yankees and being Babe Ruth’s roommate for awhile. The game was his life. [With the Angels,] he enjoyed what he did, he enjoyed being a coach, he enjoyed keeping the charts during the game and took pride in that. He wasn’t just a father figure on the team, and I was there eight years. You used the term “father figure.” What was your relationship with him? Ryan: He and I struck up a friendship the first year I was with the Angels and became really close friends. We’d go to lunch a lot when we were on the road. He was a master of the fungo. He spent all of batting practice hitting fungoes to people, whether [to] the pitchers or hitting ground balls so you could work on your fielding. He was always available. He went to the ballpark very early and got in uniform and was available for anybody who wanted to do extra work or early work. Ryan: I just think it was his personality, his demeanor, who he was, his commitment to the game. It was who he is – or was. You even named your son Reese after him. Ryan: I did. That’s exactly right. Ryan: He definitely had an influence on me, and I thought he represented what to look for in a lot of people. I wanted to honor him in that way. I thought if Reese could grow up to be the person Jimmie Reese was, it’d be quite a thing. How did Jimmie Reese react when you told him you were naming your son after him? Ryan: I think he was honored. To be honest with you, I don’t recall [what he said]. When you speak of his traits that you wanted your son to carry on, which traits do you mean? Ryan: He was a caring person who was available to help anyone who sought help. He was an honest person, very low-key and had a lot of nice qualities. Did you have common interests, things you liked to talk about, beyond baseball? Ryan: He had a hobby of making picture frames, and he had a workshop. That’s how he spent a lot of his off-season, in his workshop, doing things for people out of the goodness of his heart, not to make money or anything. He framed mirrors and things like that. He was always wanting to do things for people. Did he make frames for you? Ryan: Oh, yeah – he did for everybody. In those days, you had the AP and UPI photographers, so if something happened, they’d bring a photograph in that they took. He’d take them and frame them for people so they’d have a memento of the event. Did he do that for any of your big games or no-hitters? Ryan: Yeah, he did it for different events. He did it for players on the team so they’d have a keepsake from it. Norm Sherry told me that Reese was such a master of hitting fungoes before games that he would hit them in such a way as to make the pitchers run but not quite be able to catch them. Ryan: He had the ability to hit the ball where he wanted. They’d have him run the pitchers, and what Norm says is true: that he had the ability to make you run hard. That’s why they utilized him – because it accomplished what they wanted to accomplish. How many pounds do you think he cost you? Ryan: (Chuckles.) I don’t know. I ran for hours for him. Over that eight-year period, that was a big part of my routine. I don’t know many coaches in baseball history who are known for one particular skill. Ryan: He was very unique in that way. The other uniqueness is: He didn’t use a fungo bat. He took a regular bat, and cut it down the middle to lighten it up. He usually liked to use a hardwood bat, but in those days there weren’t a lot of hickory bats, so he’d just wear ’em out. He’d have to make another one. He was very well-known for his fungoes, and in fact my son Reese has one in a shadow box in his office. Jimmy gave it to Reese when I was still playing with the Rangers, and the boys went out to California with me and got to meet him and be out on the field with him for two-three days. What would you say is the impact he made on you as a person and as a player? Ryan: I think it was his outlook on life. He just enjoyed people, and he enjoyed working with people. If somebody wanted to try to better themselves, he was available to help them and do what he could do. Do you think you’ve taken along any of those traits and applied them? Ryan: I think he had an influence not only on me, but on a lot of people he worked with and were teammates of his – so, yeah, I think very much so. If you went back and talked to a lot of those pitchers, they’d have very fond memories of their relationship with him. Norm Sherry: I didn’t even know he was Jewish until much later. I remember that everybody liked the man. He was a great worker, and was an older guy. He hit fungoes and all that stuff, and was really agile. He’d “run” the pitchers with the fungo bats. I was the pitching coach and I’d want my pitchers to run, and he’d hit these fly balls to make them run after. He’d make it so they’d almost catch ’em; they’d have to get a good run in to catch the ball. That was the last 20 minutes of batting practice. He took a bat and cut it in half at the top, and could use his bat to play catch with you! He was really good. He had a [woodworking] studio in his house – he lived in Santa Monica – and he made frames for people’s pictures. Everybody asked him to do that for them, and he never charged anyone. It was really neat. He did it for a lot of guys [on the team]. Sherry: Everybody loved him. If you didn’t like Jimmie Reese, there was something wrong with you. He was always friendly, always had a smile. He’d say nice things to you and make you feel good all the time. He said he roomed with Babe Ruth when he played for the Yankees. He said he roomed with his luggage, but never saw the Babe. Could you imagine being in uniform like Reese was, hitting fungoes into your 90s? Sherry: God Almighty, no! If I picked up a fungo bat [now] and swung, I’d probably miss! Hillel Kuttler is an award-winning features writer who writes on sports for the N.Y. Times, the JTA, Haaretz and other publications. He has covered the Olympics, the Super Bowl, NBA playoffs, the Maccabiah and European Maccabi Games, and from 1993-99 served as The Jerusalem Post’s Washington bureau chief. Hillel can be reached at hk@hillelthescribecommunications.com.